Any individual or family who are not ROHS members and joins the Society at the one-year level or three-year level will be provided with a Gift Card to be used toward the purchase of hostas from one of the participating businesses owned by ROHS members. The new member is entitled to the Gift Card on a one-time basis only. If the new member joins for one year and fails to renew the next year, they are not eligible for a Gift Card in future years. The Gift Card will be mailed to the new member after receipt of their dues. The value of the Gift Card is $12.00 (the cost of a one-year ROHS membership) and must be used toward the purchase of hostas at one of the participating businesses. Gift Cards must be used the year received (unless after October 1st). The Gift Card must be presented and signed by the new member at the time of purchase. Gift Cards are non-transferrable. 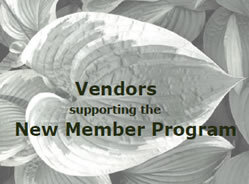 The Russ O�Harra Hosta Society thanks the businesses owned by ROHS members that are supporting the New Member Program. The Russ O�Harra Hosta Society meets three times each year. Recent meetings have been held at the Iowa Arboretum near Madrid, the Newton Arboretum, and the Neal Smith Prairie Learning Center near Prairie City. Spring and Fall meetings are held on Sunday afternoons. A speaker with a presentation on a garden-related topic follows a delicious potluck meal with the business meeting concluding the day. A garden tour is held each summer. The tour is an all-day Sunday event and includes gardens featuring hosta in Central Iowa. After lunch, a hosta and companion plant auction is held as a fundraiser for the Society. Membership dues are for a calendar year and are payable January 1st of each year. Dues received after October 1st will be applied to the next calendar year. 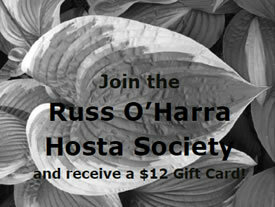 Make all checks or money orders payable to “Russ O’Harra Hosta Society.